Perhaps the most difficult part of creating a hit show is not only finding a unique story that could sustain (hopefully) multiple seasons of television but also anchoring the series on a protagonist audiences will continue watching. The best television shows (and oftentimes the most successful ones) strike a balance between those two criteria. The Marvelous Mrs. Maisel hits both on the head. 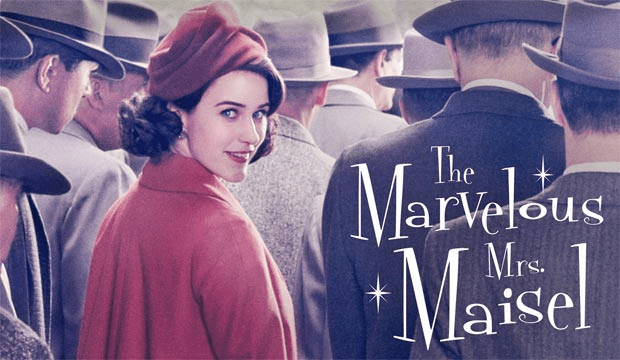 Created by Amy Sherman-Palladino of Gilmore Girls fame, the series follows a Jewish housewife, the eponymous Miriam Maisel (or Midge as everyone calls her), as her life falls apart and she begins a career as a stand-up comedian in the late 1950s. The pilot opens on her wedding as she gives her own toast. Midge effortlessly brings down the room as she recounts how she met her husband—and also offends half the mostly-Jewish attendees when she reveals the eggrolls contain shellfish. Three years later, Midge supports her husband Joel, a wannabe comedian who can get laughs only when he steals Bob Newhart’s routine, and helps him with his act from the sidelines, keeping track of which jokes get the most laughs in the most Type-A way possible. However, their marital bliss quickly evaporates when Joel reveals that he’s sleeping with his secretary. From there, Midge has a bit too much to drink, wanders onto the stand-up stage, and absolutely nails it. Right away, the show earns points for originality. Although the show is ostensibly about the very real stand-up scene of the late 50s (Lenny Bruce is a frequent character), Midge is a fictional character, and that allows Sherman-Palladino more opportunities to explore the sexism of the era, among other things. Midge’s point-of-view is one we rarely see on television, especially in this setting. As strong as the writing is, perhaps the show’s greatest asset is Mrs. Maisel herself, Rachel Brosnahan. Brosnahan oozes charisma and sells each of Midge’s jokes. This is one of the rare depictions of stand-up where the stand-up is actually, you know, funny. The show has already won awards for its first season (most notably the Golden Globes for best comedy series and comedy actress) and deserves all the praise it gets. As a comedy series and a character study, you couldn’t do better.